It’s been 11ish months since my first post on Hayes in the Fog, and heading into last fall, I aimed to write here twice a week: one Sundae Sunday recipe, and one additional post. Making such an ambitious goal while ramping up my classes AND a newish full-time job was a tall order to fill. Some weeks I reached that goal, but many others I didn’t. By December, it proved too much. The Sundae Sunday creations in particular have been fun and stimulating, but they also caused logistical nightmares on Sundays where I was scheduled to teach baking classes. Fear not, ice cream lovers: frozen dessert content isn’t going anywhere. How did I “handle” it? In typical fashion, I beat myself up a bit about it, tried to assess how I could keep the blog post pace up anyway (spoiler alert: I couldn’t), and then decided a short blogging break was in order. My body snatched that break from baking and both jobs by fighting back in every way possible: migraines, fevers, bloating from flour-heavy food like never before (my greatest fear realized), and overall exhaustion. In short, I experienced burn-out like I never have before, and frankly, it sucked. I didn’t feel or look like myself, and those close to me called me out on it, too. The short break extended itself through most of January. What helped me recover? 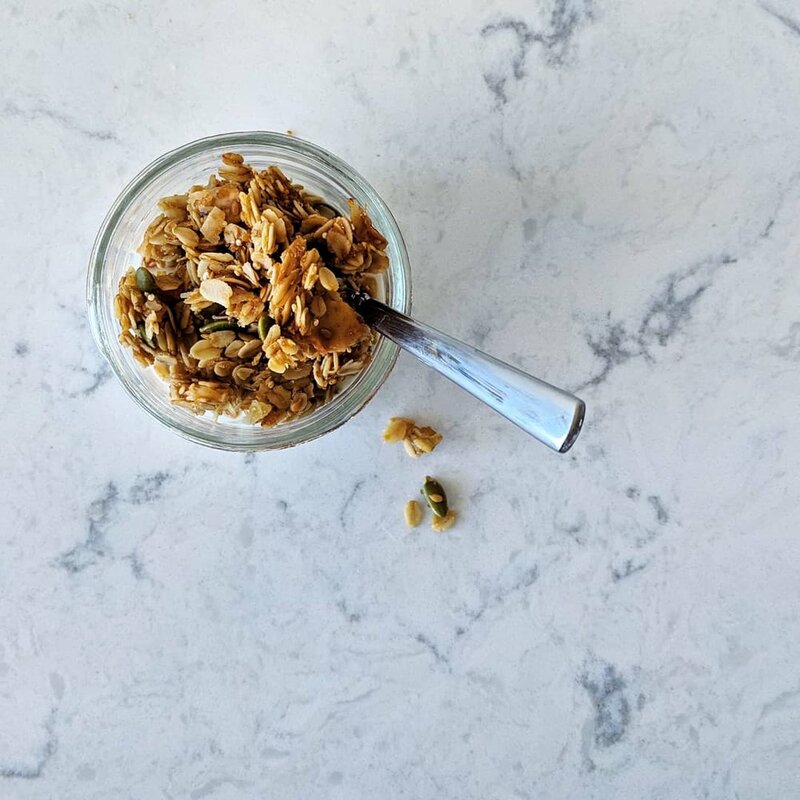 Many batches of this coconut ginger granola. Use it when you need a pick-me-up, or even when you don’t. Preheat oven to 325 degrees F and have a baking sheet lined with parchment paper ready. Set aside. In a small pot, like the All-Clad butter warmer I use, melt the coconut oil over medium high heat. Set aside to cool slightly. 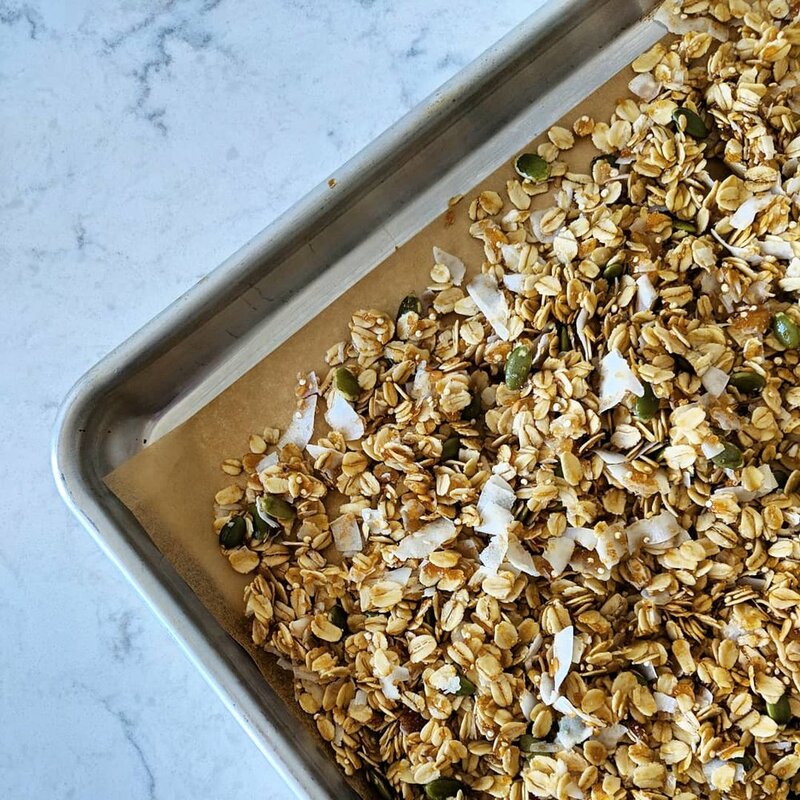 In a large mixing bowl, add all your dry ingredients (oats, sugar, coconut chips, pumpkin seeds, quinoa, flaxseed, salt, and ground ginger) and mix them together with a spatula. Mix in all the wet ingredients (agave syrup, melted coconut oil, grapeseed/canola oil) to the dry ingredients. Tip out everything onto the parchment-lined baking sheet and bake for 30 minutes. No stirring needed, but you can rotate your pan at the 15-minute mark. While the granola is baking, mince your crystallized ginger and set aside. With 2 minutes remaining in the bake, take the pan out and sprinkle it generously with the ginger and flaky sea salt, and bake for last 2 minutes. Let cool slightly in the pan, and once it’s cool enough to work with, break up into bite-sized clusters and store in airtight container until eaten. Instead of a canola/coconut oil mix, use coconut oil only for an even bigger punch of coconut. Amp up or down the amount of crystallized ginger you use. Use organic brown sugar if you don’t have turbinado sugar on hand. Add in nuts; I love cashews with coconut.